I did it! I completed my third half marathon today at the Monson Memorial Classic. The entire event is comprised of a 2 Mile Fun Run, a 5K and the Half Marathon. The races are run in memory of sisters Kelly Waldron and Kathy Waldron Perry who died eight months apart from different types of cancer. This year proceeds from the race are going to support the SHADE Foundation which provides education and awareness towards skin cancer prevention and Griffin’s Friends, a local organization dedicated to providing support to children with cancer and their families. It’s a great event, very well organized, family friendly and an incredible after race event with a huge spread of food, fruit, water bottles, yogurt and bagels. The best part is that my best friend and her family live in the town. The race goes right by their front yard. Orlando and Carlos stayed there while I ran. 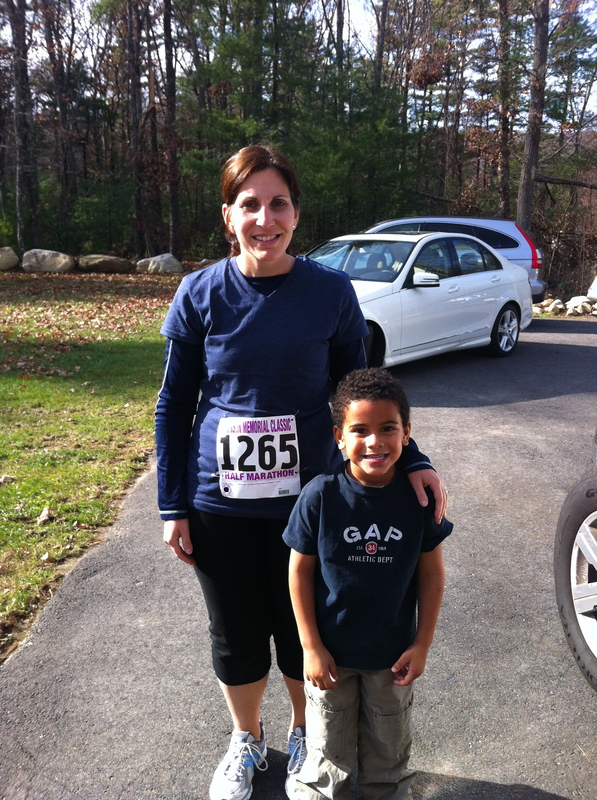 My friend and her oldest son ran the 5K last year. They hope to join in again next year. It’s definitely an event I can see making a yearly tradition. It was a fantastic race, perfect weather and a lot of hills! Serious hills. These hills didn’t quit and neither did I. Back with more on this race but right now I need to get some sleep. 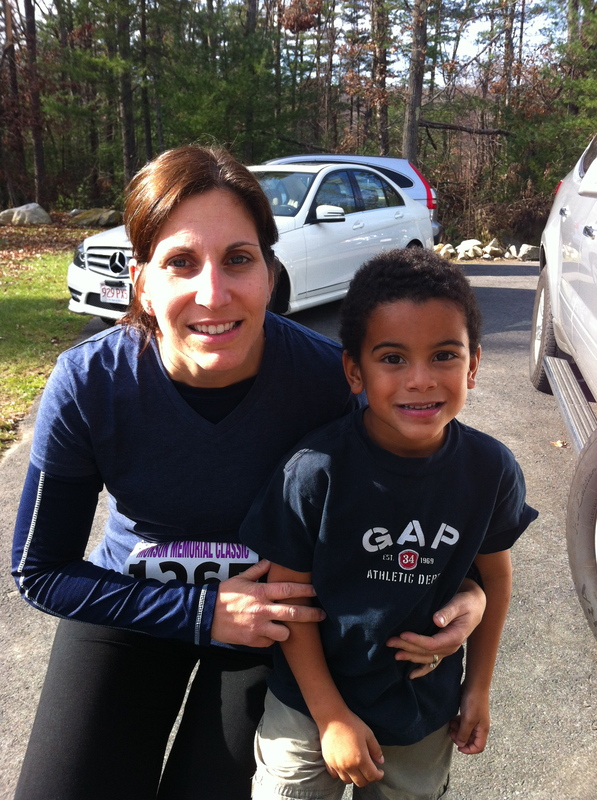 I’ll close with the obligatory Mommy and Carlos photos I get before each race. I should note that the sporty little Mercedes behind me is not mine! Cute though. I’ll be back tomorrow with a race recap and my marathon training from last week. Congratulations Aimee! We has the most beautiful weather here this past weekend. Was it like that for your race? I hope so. The background looks pretty. You’re looking very athletic with 1265 on you. And Carlos, charming as always. Congrats, Aimee! Glad you had a good race! Aimee…those pictures look great! What a wonderful way to remember each race and to see the changes in you both…you are looking so healthy!!! I am definitely confronting a fear posting photos of myself, but it is helping to change how I view myself. Thanks for your nice words. I feel great. Congrats Aimee! I’m really glad that you had a great race 🙂 It sounds like it was an awesome race to take part in. I can’t get over how cute Carlos is!! Thanks Sam. He is a charmer! Thanks Errign, any chance you could send me a link to the other recap. I have only found one other blog from my area. It would be great to connect with others.